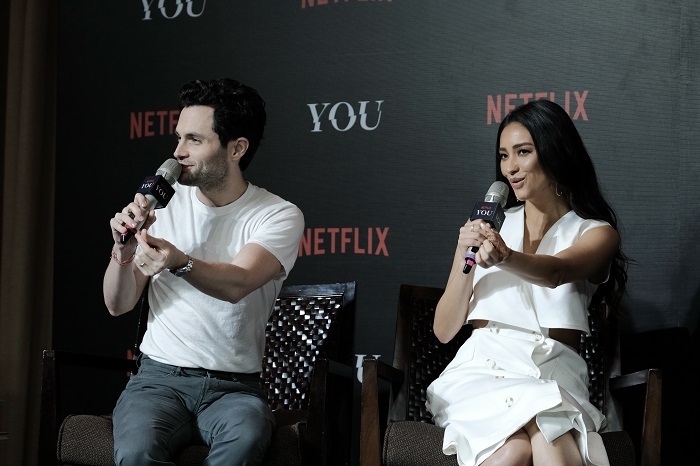 Lead stars of the Netflix’s latest hit series, “YOU,” Penn Badgley and Shay Mitchell, are currently in Manila to promote their show and meet their Filipino fans. Both actors expressed their excitement to talk about their respective roles in the show, as they faced members of the press this morning at the Peninsula Manila. The thriller series based on the novel “YOU” by Caroline Kepnes, revolves around Joe Goldberg (played by Penn Badgley), a bookstore manager, with a dark secret, who gets obsessed with an aspiring writer named Beck. Just when you thought Joe is the ideal guy that you’ll be rooting for from the beginning until the end of the show, wait until you get to the part where he tries to remove any obstacle that gets in his way of being closer to the love of his life, including the people that matter to Beck – one of which is Peach Salinger, played by Shay Mitchell, who rose to fame as Emily Fields, in the teen drama TV series, Pretty Little Liars. Penn admitted to the press that he had a bit of a trouble about his character, Joe, when he first read the script, since he’s going to play the role of a disturbing character. For Penn, he disapproves of how fans of the show are romanticizing and defending his character, and thinks that the audience should contemplate on why Joe Goldberg’s behavior is not to be adapted nor tolerated. “I think I have a lot of reservations, which is appropriate. Now we can all watch something and feel somewhat responsible. I think that’s the thing – that we are able to consume it this way, that it is enjoyable. I kinda have to take the burden of making it somehow real for myself,” Penn continues. Shay, on the other hand, also shares her thoughts about how she tries to balance her private life and what she shares to the public via social media. For Penn and Shay, people should be more critical when it comes to sharing and believing things they get to see or read online. Learn more about Penn, Shay, and their thoughts and experiences in shooting “YOU,” by catching them in their fan meet tomorrow, January 15, at the pop-up Mooney’s Bookstore in Greenbelt Gallery, Greenbelt 5, starting at 5 in the afternoon. Pickle Rick Funko Pops Coming Soon!